Facial steaming is a cost-saving and easy way to cleanse and improve the health of the skin. It is a simple skin care routine in which you allow your face to absorb steam from a hot bowl of water to moisten and cleanse your facial skin. Since many years, a facial steam or sauna has been a prominent part of various beauty treatments at spas or health clubs. In the last few years, this popular method has advanced and become more convenient, because you can buy your own steamer at an affordable price. However, some people still prefer the old bowl method, which is equally effective. Steaming your face opens up the pores and helps the skin to get rid of dirt. When the face comes in contact with the warm steam, the dirt and the dead cells are pushed out, which in turn cleanses your skin. This technique also softens the blackheads or whiteheads and boosts their quick removal. Facial steaming further prevents skin irritation and infections caused due to clogged pores. Dry skin often looks dull and tired. Face steaming increases the suppleness of the skin and prevents dry skin. It increases the production of natural oils, which moisturize the skin. Steam further increases the permeability of the skin, thus enabling it to absorb the skin care products better. However, steaming your face frequently may have the opposite impact and may reverse the benefits. Remember not to steam your face more than once a week. When you steam your face, the warm steam triggers a thermoregulatory response and increases perspiration. It results in widening of the blood vessels in the skin. This causes increased flow of the oxygen and nutrient-rich blood towards the face. Such a blood circulation improves the complexion and nourishes the skin. The skin is constantly exposed to chemicals, pollutants and toxins, which can affect the complexion as well as the texture of the skin. Steaming is a natural way to give your face a skin detox. Exposing your skin to steam allows the removal of dead skin, toxins and bacteria. This allows the skin cells to renew and revitalize. This technique nourishes the skin and gives you a clean look. When your face comes in contact with the heat from the steam, you begin to sweat. Such an action helps in the quick removal of toxins from the skin. Clogged pores are the main reason, which contribute to acne breakouts. Dirt, toxins, impurities and bacteria may accumulate on the surface of the skin, and all these aggravate acne. Facial steaming is a helpful and easy way to prevent acne. Facial steaming helps the skin to get rid of impurities and dirt by opening up the pores. and enhances the absorption of acne medication or ointments. Facial steaming is completely relaxing and soothing. Besides boosting skin health, it helps you to relax and feel fresh. Adding natural herbs or essential oils to the water further enhances the results. It helps the nerves to relax and soothes your senses too. The best part is you can experience this aromatherapy session easily at home. Sinus is often accompanied by congestion and headaches. Facial steaming can relieve the symptoms of sinus and help you feel better. Breathing in the vapor fights off dry air on your sinuses. It gives a natural massage to your sensitive sinuses, which facilitates easy inhalation and exhalation. By adding essential oils to the water, you can reap some extra benefits. You can add eucalyptus oil to clear nasal and sinus congestion. Facial steaming can make you look younger for your age. Exposure of the skin to chemicals and toxins reduces its ability to hold moisture. 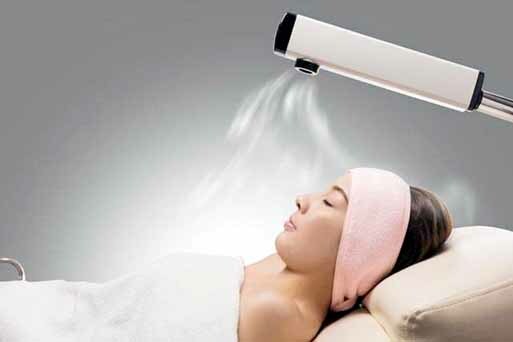 As a result of this, the elasticity of the skin reduces and wrinkles begin to appear on the skin. Steaming your face once or twice a week helps to restore the moisture and makes your skin clear and fresh. It enhances the blood flow towards the skin, which boosts collagen production and results in firmer skin. Facial steaming helps the skin to absorb skin-care products better. It increases the permeability, enabling the skin tissue to absorb the topicals more easily. This enhanced effect is because of the clean pores caused by facial steaming. Clean pores take up the skin-care products more quickly as compared to clogged pores. Hence, for a better and advanced impact apply the skin-care products after facial steaming. Beauty treatments and beauty products may increase your money expenditure. You don't need to spend out big bucks for a facial steam at a salon or spa. You can easily enjoy the benefits of facial steam at home without taking too many efforts. It is economical as well as convenient and you do not need any special equipments. How to do Facial Steaming? Heat the water and bring it to a boil. You can do this over the stove or in a kettle. Pour this water into the glass bowl and add essential oils, tea or herbs. Hover your face above the bowl and maintain a distance of approximately 15 centimeters away from the surface of water . Gently turn your face in all directions and allow the steam to blow on all areas of your face. Cover your head with a towel so that the steam does not escape. Relax and sit in this position for 5-10 minutes. People with a sensitive skin should steam for not more than 5 minutes. After steaming, wipe your face with a clean face towel and apply a natural moisturizer to restore the moisture and suppleness.